Whether you want to learn about young people, or you’re a youth leader, or you’re a young person yourself – there’s something for you this week. 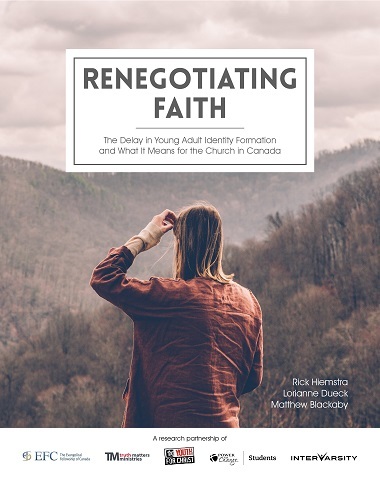 The lead researcher for the recent Renegotiating Faith study will be teaching in New Westminster and at two Abbotsford venues later this week. The study covers a lot of ground, with 15 chapters covering topics such as Emerging Adulthood, Religious Transmission and Life Choices After High School. The importance of mentoring/guiding. Any parent (or church) with students moving from high school to post-secondary education should take note of the importance of having home church mentors who will connect students to other churches and campus Christian groups – if they want their kids to carry on in the faith. When they move out, will their faith move with them? UGRE. This unappealing acronym stands for Universal Gnostic Religious Ethic: “In our interviews, many young adults talked about something behind all religions, as if there were a greater, deeper reality that they had discovered that others (usually their parents or grandparents) have not been able to discover. . . . It is an ethic rather than a religion. . . . Although the beliefs we label the UGRE often appeal to young adults as if they were a new spiritual discovery, in fact they echo ancient heresies long rejected by Christian tradition.” This is not good news; clearly, more solid teaching and discipleship are required. The researchers worked on behalf of several research partners: the Evangelical Fellowship of Canada, InterVarsity Christian Fellowship, Power to Change – Students, Truth Matters Ministries and Youth for Christ. Although the sponsors of the research come from evangelical backgrounds, we agreed from the outset that this research needed to include, as much as possible, the whole church. So we worked to engage Catholic, Mainline Protestant, Orthodox and evangelical young adults and ministry experts. One other event is run by and for young leaders. YLC was a church collaboration initiative organized by local youth pastors who were leading youth ministries in the urban context of Vancouver. Their aim was to organize a gathering in which students, pastors, leaders and ministers could come together around the gospel of the kingdom and unpack its power in life and ministry. We wanted local churches and youth groups to gather together around the good news of Jesus and get a vision for what the Spirit could do in their church, city, school, context and community. Because more than anything, we want to see God’s kingdom come and his will be done in our cities, communities and schools as it is in heaven. Most of the speakers are young leaders from the Metro Vancouver area. This Sunday will be the last service at St. Andrew’s-Wesley United Church for a long time. 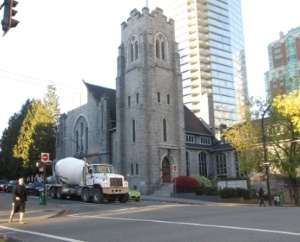 The heritage building at the corner of Burrard and Nelson in downtown Vancouver is set to begin an extensive two-year renovation project and will be closed during that time. But amid the upheaval, officials are emphasizing that the church will continue. “The church isn’t only about the building. It’s also about what happens amongst the community,” Rev. Dan Chambers told On The Coast reporter Margaret Gallagher. The long list of repairs includes a leaky roof, replacing tile floors with stone, getting new pews and bringing all the wiring up to code. Most importantly, seismic upgrade work must be done for the building, which was built in 1933. Chambers says the only reason the church was able to afford the $30 million bill for repairs is because it sold its gym and common room 20 years ago. The land was developed into a 20-storey complex. Go here for the full article, and here for the seven minute interview. Services on Sunday morning will be held next door at Century Plaza Hotel across from St. Andrew’s-Wesley, while Sunday afternoon jazz vesper services will be held across Nelson Street at First Baptist Church. 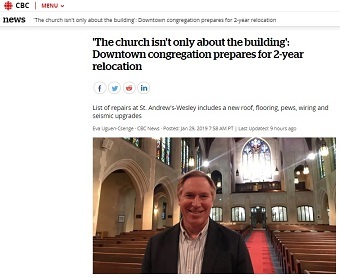 Speaking of First Baptist, it is undergoing major renovations itself – the restoration of the church building itself, along with a tower and rental housing beside the church. Some demolition has been taking place since late last fall. Go here for regular video updates.